The Hotel Collections are perfect if you enjoy the luxurious experience of sleeping in a hotel bed but in the intimacy of your own home. An array of whites and ivories combines with exquisite embroideries, precise pleating and quilting techniques to reveal Hotel Collections that are an exploration of the subtleties of shades and the striking simplicity. Finished with embroidered lines, contrasting colour stripes and flanges or elegantly simple pleating, the bedding reflects serenity yet versatility. The Hotel Collections are crafted in fabrics ranging from percale 210 TC to sateen from 300 TC through 400, 600, 800 and 1000 TC in a spectrum of colours. The Carrara bedding in cozy 300 Thread count cotton satin, features beautiful striated waves in tones of white, aqua and greys for a simple, stylish touch that brings color and personality to the bedroom. 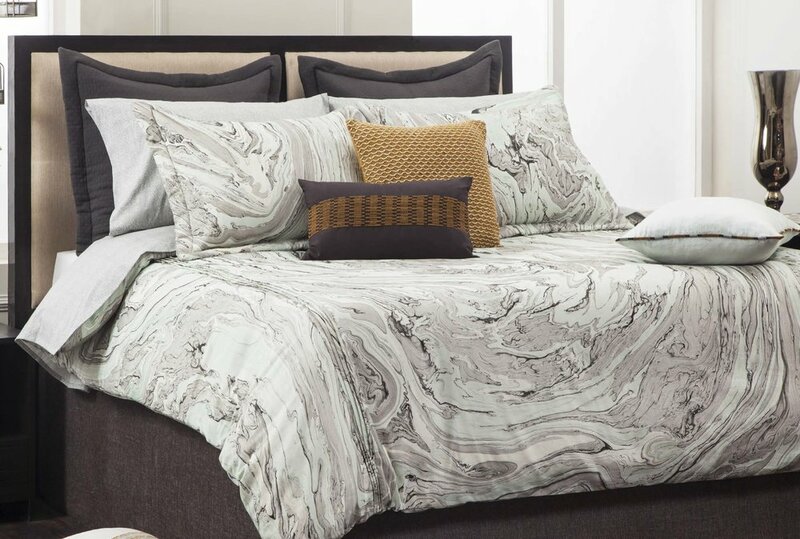 This richly striated bedding inspired from elements of nature, uses the traditional marbling technique, making each set one of its kind. Coordinating textured shams and accent embroidered decorative pillows bring a fresh interpretation to the natural look. Eden Bedding is a classic epitome of the convergence between technology and tactility. A fine balance of richness through luxurious materials, polished tones and carefully carved heat set techniques on this bedding blends itself for a timeless modernity for the stylish bedroom.Made in 100 % fine polyester, soft in feel. Admired for its breathability and softness, this bio washed linen design dresses the bed with classic simplicity. Hand quilted and lace embellished decorative pillows add to the depth and texture and the classic look complements a variety of patterns and styles. The textured bedding feels soft, has a comforting drape, is beautifully breathable to sleep beneath and is effortless to care. Beautiful and understated details are the focus. Tailored pleats in a cotton linen blend frame the duvet and shams. 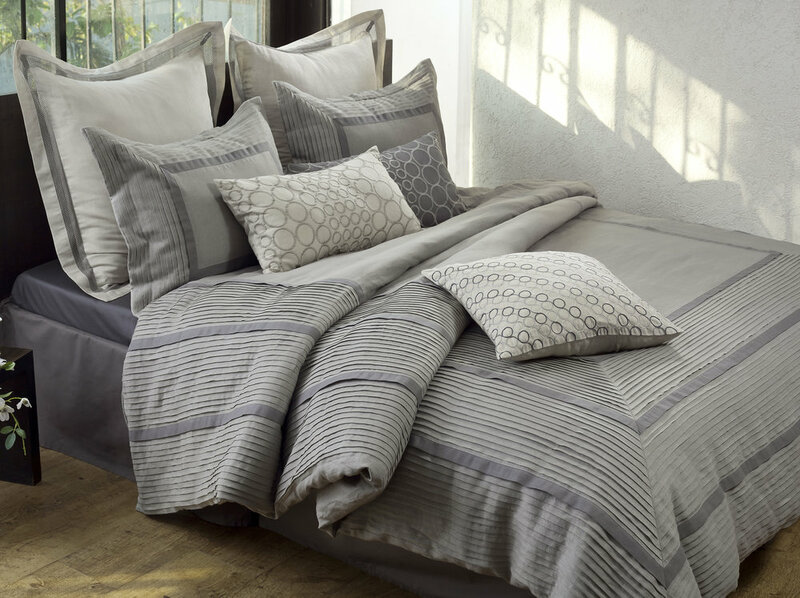 Shades of greys make this bed a sophisticated and modern look. True luxury is created in the small touches and fabrics throughout this collection, a contrasting coloured border finished with pleated texture. Cotton Linen is a lightweight, breathable fabric - its soft, silky tactility provides fresh-feeling comfort, especially suited to hotter nights or more humid environments. The Fleur duvet made from ultra supreme cotton sateen in 400 thread count, it feels exquisitely smooth, soft and silky against your skin, drapes beautifully, and has an elegant sheen.This sumptuous design with pleating and quilting running diagonally across the duvet, adds to the contemporary style for younger generation. Meticulous graphic embroidery in a gradation of greys and statement quilting lends a modern touch to the crisp white Cornell bedding. 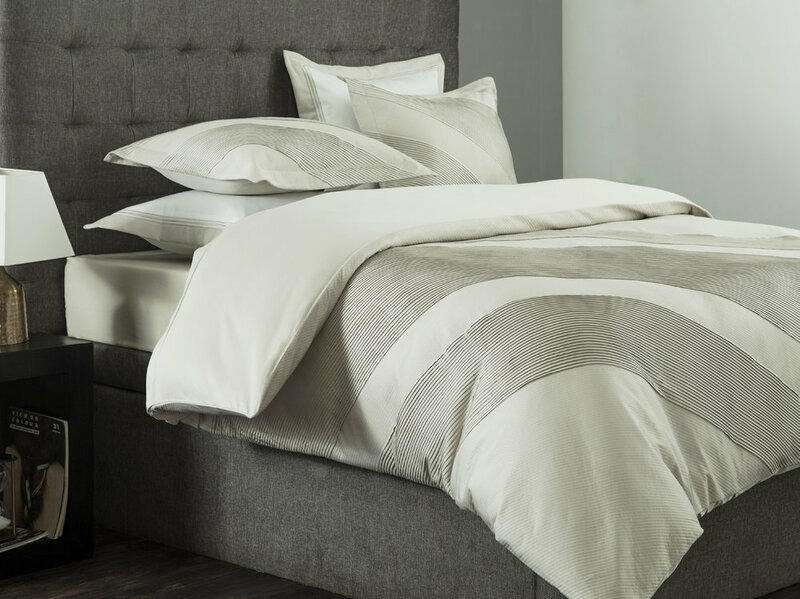 Sumptuous long staple fibre cotton satin in a 400 Thread Count is coordinated with link embroidery on the sheet sets, and precise tailoring in the Euro shams. Embroidered cushions accent the refined, stylish and contemporary design with crisp lines and simple yet striking embroidered detailing.Quilted duvet has a multi seasonal usage, it can also be used as a quilted bedspread during summer. Modern styling with detailed ironwork embroidery will transport your bedroom ahead. Clean lines in black and white with delicate patterns give this bed simple beauty. Crisp 300 thread count cotton satin fabrics and luxe matte cotton velvet are used to accent and complete the look. 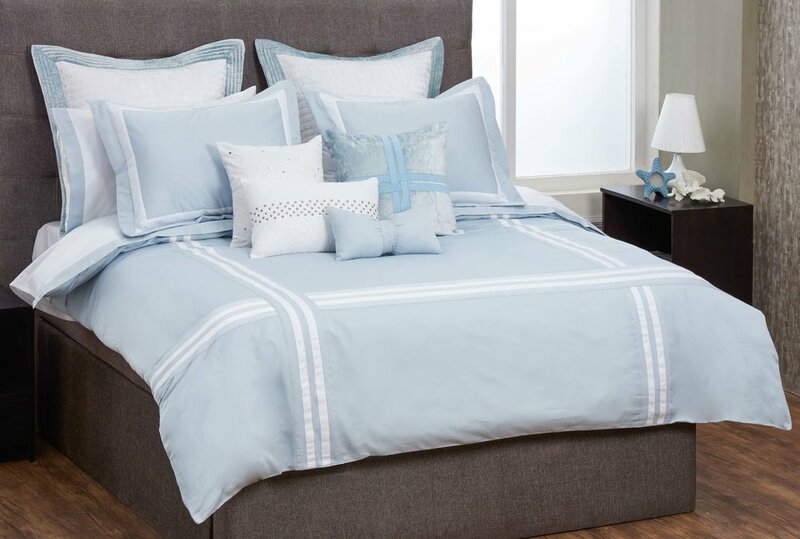 Bring hotel luxury to your bedroom with the Charlotte collection, crafted in luxe 600 thread count cotton sateen, which has an exquisitely soft feel and a beautiful drape with a sophisticated palette of powder blue and white. 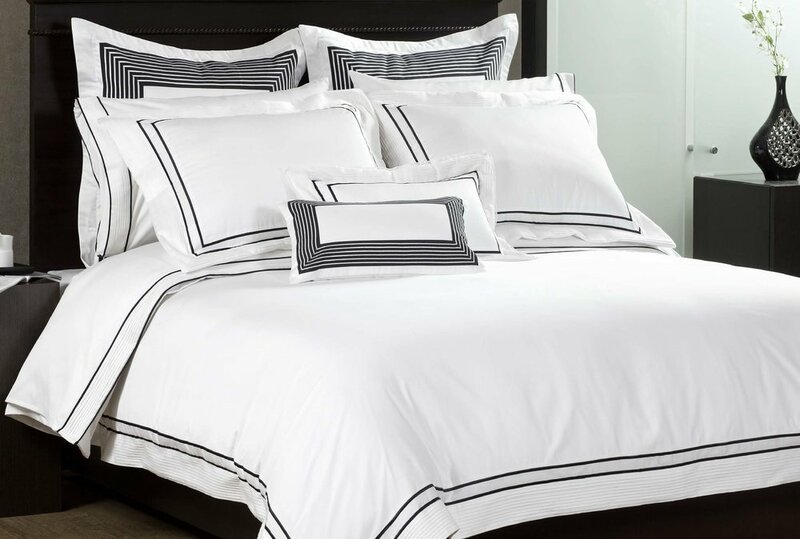 Patched stripes across the duvet cover and shams create a minimalist look, coordinated with the embroidered sheet set. Decorative pillows add glamour with lustrous sequins embroidery and metallic embellishments, the euro shams are crafted with sadle stich quilting on a subtle velvet adding depth to the ensemble. 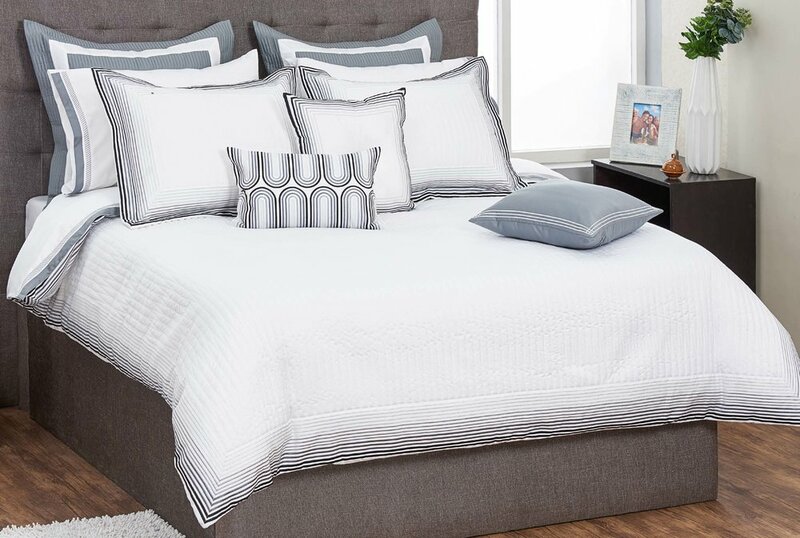 The Lucas bedding features ultra-soft, crisp 600 thread count cotton satin made of long staple cotton fiber framed by double rows of satin embroidery and delicate pleats. Bold pleated border shams dramatize the ensemble while the coordinating decorative embroidered cushions complete the collection for a stylish and classic hotel finish.